'Proof of Heaven' is a book that everyone should read. 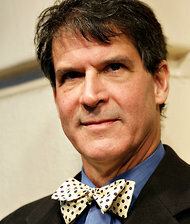 Eben Alexander, M.D. recounts his experiences during a near death experience and his journey into the afterlife. This narrative, written by a respected neurosurgeon, is one of my favorite books of all time. Though many may be skeptical, the questions and visions in the book encourage us to think about the very concept of heaven. Because of his profession, Dr. Alexander has an interesting perspective: "Still, he said, he has a trump card: Having trained at Duke University and taught and practiced as a surgeon at Harvard, he knows brain science as well as anyone. And science, he said, cannot explain his experience." wrote Leslie Kaufman in an article in the New York Times. How exciting that the interactive Town Hall series Conversations on the Green kicks off with Dr. Eben Alexander. The event takes place Sunday, August 3rd event at 3 p.m. and will be staged at the Parish House of St. Johns Church in Washington, CT. Dr. Lisa Jane Miller, Director of the Spirituality & Mind Body Institute at Columbia University will join Dr. Alexander in discussing the symbiosis between spirituality and science. Scientists have long scoffed at near death experiences, dismissing them as fantasies. Dr. Alexander, who trained at Duke and taught at Harvard, was one of those skeptics. Then, he contracted deadly bacterial meningitis and spiraled into a deep coma for 7 days. His survival was called a miracle. But, Dr. Alexander asserts the real miracle was what he learned from his near death experience: that consciousness is independent of the brain, that death is an illusion, and that an eternity of perfect splendor awaits beyond the grave. All proceeds will benefit Greenwoods Counseling Referrals, Inc. a non-profit agency that provides referrals for affordable mental health and social services in Litchfield County. Angels on the Green tickets are $250 per person and include preferred seating and attendance at a reception with Drs. Alexander and Miller following the conversation. Call Greenwoods at 860-806-6003 or email: greenwoodspresents@gmail.com.